... art to make your senses pop. Join L&LG for Breakfast. We're creating our very own shrine to Sunday morning with a riff on uber-domestic morning rituals: a communal 4am Sunday 'making of the bread' installation, 90's Sunday morning kids TV, a giant breakfast vending machine, and a Mr Motivator-inspired wake-up routine. 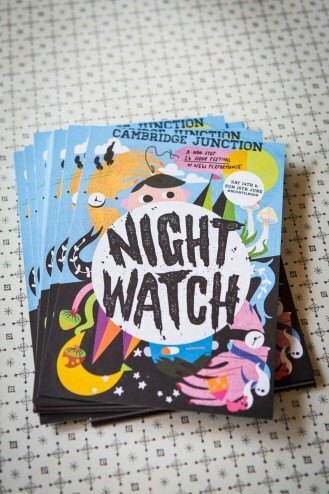 - a Junction Theatre Commission for NightWatch, a 24 hr Festival, June 2014. The inspiration for L&LG Do Breakfast came from our most vivid early memories of Sunday mornings growing up in the UK. We thought: SM:TV, the BBC test card, Mr Motivator, kids cartoons, making bread in the kitchen, flour on the kitchen table, Live and Kicking, play-doh, playing with your food and unnaturally-coloured kids breakfast cereals. In a nutshell, we decided we wanted to create our very own shrine to Sunday morning. For this one-of-a-kind 24 hour festival we devised an experience that began in the wee hours and ran through to breakfast. At 3am we set up our 90's inspired through-the-night bakery, complete with rave music and neon lights, then asked people to join us to make the bread for breakfast. To give the experience a mischievous, child-like Hook-esque twist, we enabled people to add red, yellow or green food colouring to their bread and get very messy in overalls supplied by us. At 8am, the images on the TVs switched from test-card to classic UK morning TV as people (who had been up the best part of 24 hours) congregated to receive their breakfast from the L&LG Breakfast Vending Machine installation. In order to collect their breakfast however, participants had to complete a very special morning workout... 'Clarissa & Melissa Work it Out'. Once they were all worked-out participants came to collect their breakfast sandwiches- an all-in-one breakfast wonder sandwich: egg, bacon, tomato, mushrooms and hashbrown all put together in chunky home-baked, brightly coloured bread. Lemonade and Laughing Gas are a unique events business bringing you unusual, hyper-theatrical and mega-fun events and parties to make your senses pop.